The weather is finally warming up, and that means it is time to break out my flip flops! During the summer, my daughter and I both live in our flip flops - they are the perfect summertime shoe! 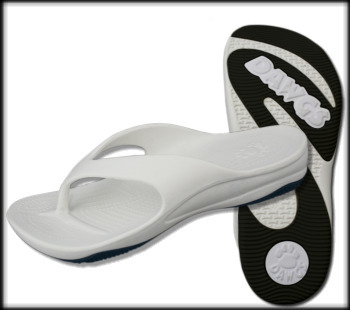 Quick, cool and comfortable - perfect for the park and the beach! To be honest, I had never heard of Dawgs footwear until I was contacted about reviewing a pair. I took a look around their website, and instantly knew that I would be requesting a pair of their rubber sole flip flops! I was very impressed with their styles and variety. They have functional shoes for the entire family: women, men, children and babies! Boots, sandals, flip flops, golfing, garden and so much more. Dawgs footwear is also available in a variety of stylish and functional colors, making them the perfect choice for any outfit. 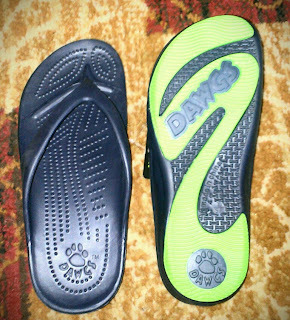 I love my Dawgs flip flops! They are lightweight, stylish and super comfortable! I love that they have the perfect amount of support in all the right places, and they stay on my feet whether I'm walking or playing tag with my children. This giveaway will end June 6th at Midnight EST. I like tan and black. I would choose the black and tan sandals. The Peacock / White is my favorite! Thanks! Peacock & White. Thanks for the giveaway! Since I love blue, I'd choose peacock and white! IT would have to be Navy and Lime Green....though Angela would want the hot pink and white. I would love the all black ones! I would choose the peacock/white!